Our team has been exploring the term "creative placemaking" and building understanding around ways that art and culture can strengthen our local economy. We found this interview with LISC's director of creative placemaking to be really informative and helpful in our learning process. We are still in learning-mode around the best way to invest in creative placemaking in St. Johns and would love to hear from neighborhood artists and community members! Here are some programs/projects we have invested in to date. Please fill out the form below and share your ideas with us. In partnership with Design + Culture Lab, SJCO launched the St. Johns Neighborhood Love Locks project in 2016. This interactive public art project featured placing 4 installations across the St. Johns neighborhood, including at Roosevelt High School and George Middle School. 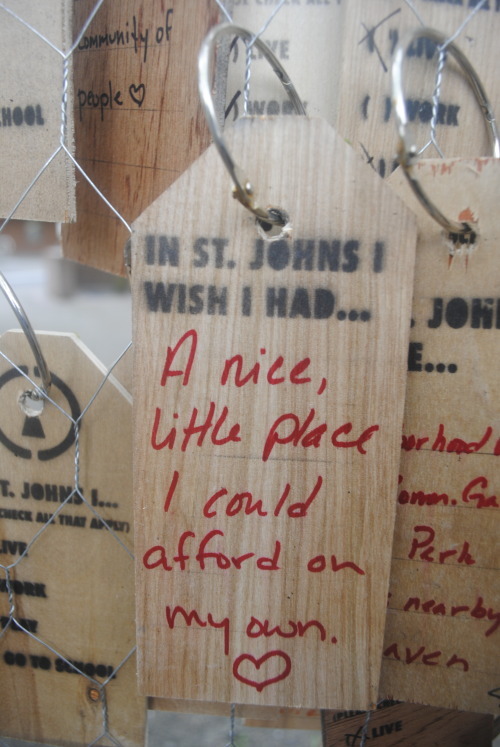 Community members were prompted to respond to the following statements highlighted on handcrafted locks, "In St. Johns I Value" and "In St. Johns I Wish I Had". The responses from the Love Locks were tracked and then summarized in a report produced by Design + Culture Lab. You can see photos of all of the wooden locks here. One of our first big undertakings was installing locally-designed trash cans in the business district. This project occurred in 2011 when we were still operating as St. Johns Main Street Coalition. Josh Guerra, a St. Johns resident and architect, was the lead on this project and also the chair of the Main Street Design Committee at the time. You can read the project overview here. The Canopy: A community art project of encouragement was devoted to spreading positivity throughout the St. Johns neighborhood. Made simply of PVC, fabric strips, and a colander, visitors interacted by twirling among the colorful ribbons and adding their own words of encouragement to the installation. Then, 2 months later, community members removed the strips of fabric with writing on them and passed them on to a stranger. We wanted to know what makes community members happy. So, we asked folks to paint their own canvas flags with a representation of what makes them happy over the course of a summer. Currently, the Happiness Flags travel to different events and are colorfully displayed for attendees to enjoy! St. Johns Speaks was a series of storytelling events featuring local resident storytellers, Spit/WRITE youth poets (Roosevelt High School), performances by the Cathedral Park Performing Arts Collective's Intergenerational Choir, and interactive exhibits around history and resident stories. In the spring of 2016, we hosted two events - one at the historical Baha'i Center and one at Cathedral Park Place. Currently, the newly formed St. Johns Museum Steering Committee, is collecting stories of long-time residents and underrepresented voices and will be showcasing the stories on their website in late 2018. St. Johns Rising was an interactive public art project at the June 2017 Art Constitutional. The project asked St. Johns residents to reflect on their hopes and worries for the future of the neighborhood by creating individual feathers to add to a large set of wings designed by local artist, Kirista Trask. Residents were then encouraged to spread their wings and take a photo with the mural #stjohnsrising. Share your ideas with us here!